A survey of secondary market pricing for dozens of smartphone and tablet models has found that the iPhone and iPad carry significant resale premiums over their competitors, which which is expected to bode well for Apple among customers looking to upgrade to the company's latest devices. Analyst Timothy Acuri of Cowen and Company looked into resale values of 40 different smartphone models and 23 different "premium" tablets released over the last four years. 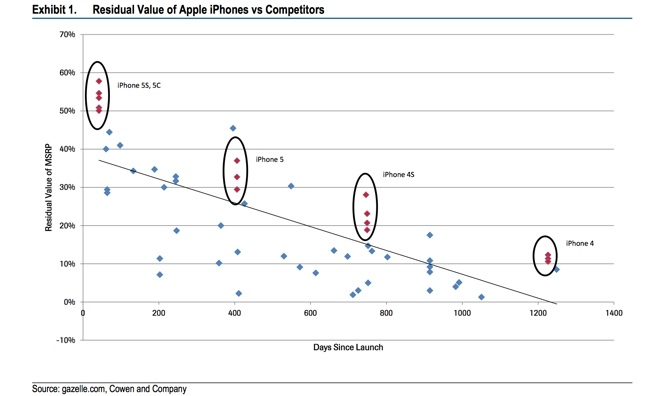 His data found that the iPhone carries an average premium of $128 over competitors, while the iPad is on average worth $67 more. "Our data suggests this is largely independent of the duration the product has been on the market, even (3 to 4 years) out when virtually all other competing values have virtually no value," Acuri said. "Given an extremely thriving secondary market, this premium is effectively a subsidy for consumers." In his eyes, the data shows that the market places a great value on gaining access to Apple's hardware and software ecosystem. It also suggests that resales of Apple products could become a key driver for product upgrades, and could be a key factor in Apple maintaining pricing premiums. There are a number of companies online, such as Gazelle, NextWorth, uSell, Amazon and eBay, that offer cash or gift cards in return for trade-ins of Apple products. A breakdown of product values through these partners can be found in the official AppleInsider Trade-In Guide. While trade-in services offer quick convenience, Acuri noted that listing products on eBay or Craigslist will unsurprisingly yield the highest return on electronics, given the lack of an intermediary party.